I have loved snow leopards for a long, long time. The first time I ever saw a snow leopard was at the San Diego Zoo. It was a hot July day. He was sleeping. I visited the snow leopards at the Bronx Zoo one year, also in the summer. They didn’t seem to have a very cushy accommodation. You can find out more about snow leopards by visiting www.snowleopard.org. It’s the website of the Snow Leopard Trust and has photographs, videos, stories and travelogues. 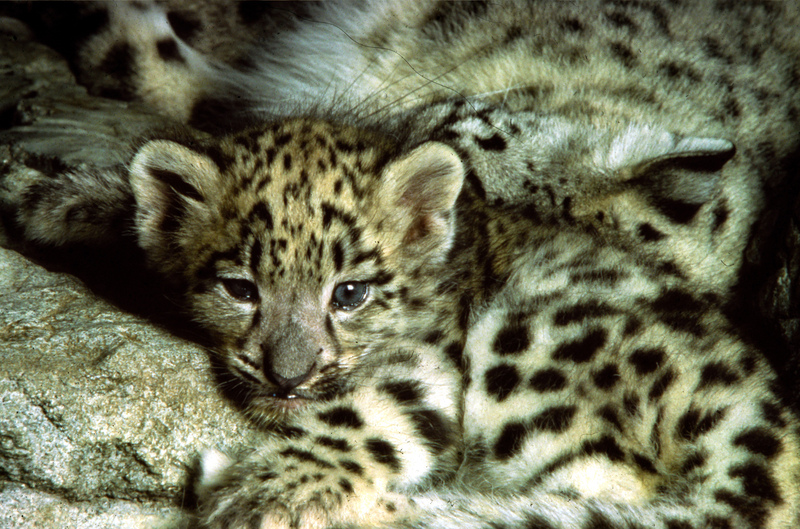 You can adopt a snow leopard and help preserve their natural habitats. Snow leopards are my power animal. I have both a mother snow leopard and a baby snow leopard. A power animal is a spiritual being that is here to help you with your work. How can you find out what your power animal is? Go into meditation. Ask your power animal to show itself. Then go on an inward journey. Stop, look and listen to what your power animal is saying to you. Years ago, I discovered my mother snow leopard. She is quite regal and is a being of few words. Snow leopards are psychic, very rare (experts estimate there are only 4,000 to 6,500 left in the wild) and protected by the Gods. One of their foremost attributes is that they are excellent leapers. They have an uncanny sense of balance. Their long tails help them stay balanced as they leap from rock to snowy precipice high in the mountains of the Himalayas. I have often felt this concept of leaping as a major metaphor for my work. I help people make major leaps in their lives. Don’t look down. Only look ahead. Take a leap and then pause to look how far you have come. I remember when I was running my radio show on www.voiceamerica.com. The entire experience was very stressful. I wrote a 10-page script every week, had to come up with guests, read their books, watched their videos and produced the show week after week. I had never worked so hard in my life. I felt that I had fallen into a pit. So I called on my snow leopard. I visualized myself down in a pit in the forest. It had felt like a trap, as if the soft floor of the forest had given way underneath me. The walls were steep and I could not get out. I visualized my snow leopard and crawled onto her back, wrapping my arms around her neck. Then my snow leopard leaped out of the pit. Shortly afterwards, I concluded my radio show at the end of 2007. You can still listen to the archives for free by visiting my website at www.totalfitness.net. It was one of the top programs on www.voiceamerica.com in terms of total listeners. Yet I was ready to be done. Years after making the acquaintance of my mother snow leopard power animal, I was in another meditation. All of a sudden a baby snow leopard came bounding out of the forest towards me. My baby snow leopard is quite playful. My mother snow leopard is quiet, gracious, always watching and very reserved. The two together express deep aspects of my personality. When I get stuck in my own life or in my work, I call on my snow leopards. Sometimes I call on my mother, sometimes I call on my baby. Sometimes I call them both. Although snow leopards are capable of taking down prey twice their size, they are the least threatening of any of the big cats. Once I gave a free medical intuitive reading to a woman in Kenya who was a worldwide expert in big cats. She had spent her whole life devoted to studying, photographing and protecting big cats like snow leopards. I told her that my power animal was snow leopard, and that snow leopard had told me to help her for free, as she had contracted a rare disease and was not able to heal herself in the wilds of Africa. I told her to call on the power of the big cats she had been protecting. It was time for them to share their medicine with her. When all other resources are unavailable, you can call on your own power animals and the special medicine they have to heal yourself. If you are interested in learning more about how to heal yourself naturally, please call Catherine Carrigan at 678-612-8816 or email catherine@catherinecarrigan.com for a FREE 15 minute consultation.